Leading Successful and Dynamic Schools: Teddy Roosevelt Didn't Worry About What People Thought of him and Look What Happened! Teddy Roosevelt Didn't Worry About What People Thought of him and Look What Happened! Teddy Roosevelt walked into the New York assembly for the first time as a 28-year-old politician. He sported the long sideburns and attire of an affluent New York City society man. Nobody took him seriously at first. Worse yet, Roosevelt was a loudmouth who didn't care what people thought about what he had to say or how he looked. Teddy marched into politics like a gang-buster. Despite a childhood of health problems, the subject of what in the modern day would be considered bullying, and clearly the least desirable looking of the Roosevelt clan, Teddy was full of confidence. He did not make a lot of friends in those first few years as a New York assemblyman, but then again, his aim wasn't to make friends. Roosevelt was out to change the world. And change the world he did. 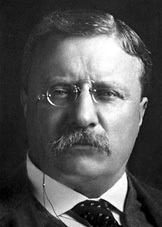 As many know, Teddy Roosevelt was one of the most successful American presidents. He was the first American to win the Nobel prize. Noted historians have credited him for having been the father of social change in the modern American era. His dedication to helping the hard working poor resulted in substantial regulation of the workplace and provided a large degree of social welfare. He passed laws regulating workplace safety and that led to the minimum wage. He is credited for having established the FDA, the first government organization to regulate the quality of food and medicine products produced in factories. Theodore Roosevelt shows us how boundless confidence and a persistent want to make a difference in the world will keep us "on the train" toward influence, no matter our personality.